As the weather warms and the fields dry, the start of baseball season nears for the Kwantlen Eagles. Jessica Rolli provides a words-and-pictures look at this year’s team. With baseball season approaching, the Kwantlen Eagles are taking steps to ensure a successful season, both on the field and in the stands. Head coach Rob Webster is hoping to make the games at their home field at Macleod Park in Langley more of an event, and working to create an atmosphere that people will look forward to attending. â€œGame days will be a blast. The score board will be up and going, weâ€™ll have an announcer for in between innings, and when the players come up to bat, theyâ€™ll have their own music,â€ said Webster. Webster is also working with the township of Langley to, one day, have a beer garden at the games, and a game-day events coordinator who is planning different activities for the fans. â€œHopefully, weâ€™ll get to a point where people will say, â€˜Hey I got nothing to do, letâ€™s go check out the Kwantlen game,â€™â€ said Webster. The team will put on fundraising events that will also be aimed at engaging the community. A pub night has just been approved and is in the works, as well as a raffle where the first prize will be a trip for two to New York to see a Yankees games. Although a strong fan base is priceless for any sports team, Webster and the team have been working hard to ensure they play a good game for anyone who does come out to watch. They practice six times a week and are constantly on the look-out for skilled players. â€œThereâ€™s a ton of talent that has come out of here that have gone on to the big leagues,â€ said Webster, motioning to the posters laced around the diamond, printed with names and MLB logos. One of the names is Brett Lawrie, who became the highest drafted Canadian, at the young age of 18 last year. Kwantlenâ€™s recent upgrade to a polytechnic university has helped entice some of the local talent to stick around and play for the Eagles. â€œNow I can draw from players who want to take a trade and I can offer a solid four-year degree to prospective players,â€ said Webster. The team’s first regular season game will be a double-header against Vancouver Island University on March 28. An up-to-date schedule of their pre-season games is available online. In late October, the Kwantlen Eagles women’s soccer team made university history, making it to the provincial playoffs for the first time and then winning bronze in the toughly-fought finals. Jessica Rolli, who covered the women through the season, provides a photographic look back at some of the play that led to the team’s success. Kwantlen alumni Pouneh Askarian emerged from the just-concluded Vancouver Fashion Week as one of the stand-out designers. After attending Kwantlen, Tehran-born Askarian moved to London and graduated from University of the Arts London in 2006. She presented her graduation collection, which was inspired by Persian art. Her latest collection seemed more influenced by Greek goddess Athena, as the models floated down the wooden runway with barely-there makeup and headbands tied around loosely-curled hair. Highlighting the set was a group of loose dresses tied at the waist. Vancouver Fashion Week ran from Nov. 4-9, with the shows taking place at a woodwork shop on Dunlevy and East Codova, and after-parties scattered throughout the city, from Granville to Gastown. In its 15th season, VFW attracted fashionistas from Vancouver and from such as cities as Toronto and Los Angeles. The Kwantlen womenâ€™s soccer team brought home a bronze medal from their first trip to the British Columbia Collegesâ€™ Athletic Associationâ€™s (BCCAA) provincial championships, held in Nanaimo last weekend. The Eagles defeated the Capilano Blues, last year’s gold medal team, 1-0 on Sunday afternoon after losing to eventual champions Langara the day before by the same score. First-year forward Kelsey Doherty scored the only goal of the weekend, and her first of the season, in the 25th minute by clearing a shot over Blues goaltenderâ€™s head. Rookie goaltender Rosemary Kelly was unbreakable, according to head coach Vladimir Samozvanov, and, along with defensive duo Courtney McColloch and Brittany McNeil, held off Capilanoâ€™s numerous scoring attempt. The year was a fairly steady one for the women, who recorded seven wins, five draws and only two losses all season. They entered provincials sitting in fourth place for their third week in a row. Kwantlen menâ€™s soccer team did not make it to provincials after a disappointing finish which ended their steady decline in the rankings. The team, made up entirely of first-year players, posted a 5-3-6 record after spending the first five weeks sitting in a playoff spot. For new head coach Vincent Alvano, the season was never about gaining a playoff spot. 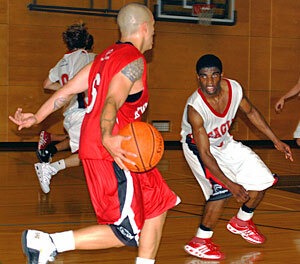 Kwantlenâ€™s Surrey campus gymnasium was filled with familiar faces Saturday night as former Eagles swooped in for a friendly game against this year’s basketball team. Friendly quickly turned fierce as the game was filled with fouls, time-outs and a real battle on the scoreboard. In the end, the current menâ€™s team proved that they will be just fine, with a 105-92 win over the alumni.